Whilst I have nothing “alive” waiting for me…at least I have an inanimate fur ball Garfield waiting LOL! Last minute conversation with Head Honcho took up an extra half hour of my going home time and I got caught in rush hour traffic. Bumper to bumper all the way till I got home. Less than 10 kilometres home, but it takes me an hour to drive home! Sigh! Dinner is a quick one…instant noodles with pork and veggies. I needed to eat as I had no lunch and plus meds…an empty tummy would be lethal! Ugh! I am unsure if you folks have instant noodles where you live?! We have loads of varieties from Maggi, Myojo to Nissin. These days Korean instant noodles trump Japanese brands. I like Korean noodles as it is thicker to slurp and spicy as in kimchi flavors in cup portions. Not too much and not too little, just right for diet portions…but don’t remind me of the salt, preservatives and probably MSG! As I kick up my heels and unwind from work, I wonder why Head Honcho is constantly and relentlessly argumentative. Nature? Or just annoying? I don’t have any answers as to how or what to make of this character. He is a slow poke, like as if he is the Tortoise and I am the Hare. He takes a week to sign off on 2 pieces of paper! If I adopt his work style, I think I cannot even clear a day’s work before another massive pile appears. But then there is the saying that the tortoise tends to win the race and so I watch, observe and adopt his style. It is hard but I am trying…. What can be worst then you entering a local chain of pharmacy and seeking for an item. “Over there, by the TV” – hands flourish in a vague direction and face staring at the counter she was stacking. Ok…Inspector Clouseau takes over. I hear some noise in the distant. I crane my neck up and voila…a TV set. I trotted off. Saw the rack of items…scanned through and no insoles. Hmm…this was not good as I have to engage the very unhappy Miss again. “Erm…Miss, I went there but insoles were not on the shelves. Can you help me please?” My eyes were literally pleading like puppy dog eyes for eye contact….she must have felt my gaze as she grudgingly got up and trotted with me to the counter. ” Ohhh…used to be there…no more” It sounded so final. What can be worst than to have advice from all over the place…at work but not the right advice. I am given a stack of invoices that occurred before I joined my current company. My Head Honcho dumps it on me and asks me to verify and approve. “Ok…..” Physically not here…I wonder how auditor would approve this. But since my signature must be worth a pretty penny, I signed them off, digging through what transpired and what was within my remit to approve. Where values went beyond several zeros, I returned them to Head Honcho. HA! Suddenly, he is Chairman of the Board. I smiled and kept silent as he unhappily signed off some invoices. With a majestic wave of their hands, they will shoo me off usually to the nearest A &E at a hospital and there I will queue like an idiot for a flu or a bug amongst the really emergency sick. I am not that sick….is how I feel when I see bloodied bodies brought in by ambulances. On the one hand, I can appreciate their dedicated oath in putting patient welfare first and not thinking of dollars they can get from me but on the other hand, I felt tired as it meant I have to trot to the nearest A & E and spend hours queueing. This was till I found Dr Martin. Dr Martin and I go back a long way and he had the gumption to see me as he had admitting rights at Bates Motel. It has been a while since I met Dr Martin till last night. He has grown older, just as I have. Sigh…even my inanimate furball Garfield is getting raggedy, so why not him LOL! As I am on a company insurance plan, Dr Martin shared with me how some patients get his goat. Some bring their sick children in and insist they be administered antibiotics. When Dr Martin prescribes a wait and see (we all know about drug overuse for antibiotics and evolution of super bugs) approach, he gets berated by irate parents. I can feel his frustration just as I feel my own frustration of each time I see the doctor, I am guaranteed “ill” as examined by any doctor and I leave the dispensary with packets of candies and syrups. I asked Dr Martin as to if I rrrreally needed “candy” and he said “yes” – two times, not once and the answer was a resounding “yes”. As I updated Dr Martin of my escapades, he congratulated me for being to walk normally despite 10 spinal implants and he urged me not to “live or make life so exciting” – LOL! Dr Martin patiently wrote up 3 referral letters for me to see specialists and he shared that most patients he will not do so as he can usually treat. There were some that asked him for referrals for the silliest of conditions that he as a general practitioner could treat but patients insist. So, I asked him if he felt the same with me ie writing up 3 referral letters. His reply was simple, ” For you, no. You need this as I cannot treat you for your implants and other ailments.” This is why I admire Dr Martin. As a general practitioner, he knew his remit and abided by it. Monday…..Must Life Be So Tough For Some? It is half a day into Monday and I am glad. Only half a day more to go as I use my lunch time to pen a few thoughts. I do have a chest infection and will probably go and visit the doctor this evening to see if I need meds or I can still pump up on Vitamins C and E. I will decide when I leave the office later this evening. I am a strong believer of Vitamin C as this has been used quite often by me to fend off bugs, especially viruses till it causes me to have visible infections and this is when I will need antibiotics. I have been burning the candles at both ends and with the amount of stuff happening on plate, I guess I caved in to the stress building up. Stress can indeed kill – or in my case, cause defence or immune systems to crash. Possibly it could be that my daily dose of therapeutic humour was lost in view of our mass national mourning that did affect me. I would be lying if I said it did not. Head Honcho gave his usual slew of unkind remarks and I gave it back to him. I felt it was time to sling it back such that he knows where I am coming from. I used to let it slide like water off a duck’s back. But with his style, I decided to return what he dishes out. Perhaps he is just obtuse with no thought that such remarks can hurt of offend others? I sometimes feel that people do not think before they speak and by doing so, it is much too late to retract as once the words are verbalised out of the mouth and into the ears of the listening party, whatever damage that can be done, is usually done. Over the years, I have learnt to stop, listen and discern before saying things that may even seem to have the slightest hint of offence. Most times, it may elude me as I may be dense – so dense that I may not even know it. Whatever the case, I do not wish to intentionally offend any one. Today I had a one to one counselling with Ms Sour Plum. I noticed from our conversation that I was interacting with a socially deviant character who has undergone school counselling for 8 years of her school life. I spoke at length to her and explained to her areas where she failed in her duties. She apologized for her behaviour and said that she will change. But the rage in her stemming from her hatred for the other colleagues in the department is worrying. Her rationale as to why she was destructive with information to me was that she did not want me to share with the others. I told her she was selfish as we all work as a team. We do not work in silos. Besides, the company does not owe us a living! I sincerely hope for her sake that my counselling on her was not wasted and that at least 30% went into her skull. She is, as a social deviant, had two options I put forth to her; (1) change for the better or (2) quit. Since she was not prepared to quit and she claims that she wants to change, I told her that I would give her the opportunity to do so. But if after a specific time frame we both agree on and we see no progress, then she faces termination of her services. This is the least I can do to lend value to the life of a social deviant and that I urge her to seek counselling from a psychiatrist to manage her anger and hatred for the others within the department we worked in. I felt sad for her as she is in her mid 20s and for her to have such a perception of life, it will take her a long and arduous road to grow old and happily too. I left two phrases for her to think over…. (1) letting go and (2) be prepared to forgive others else the hatred will grow, fester and become the focal point of her character. HA! I may be great at 1,000 piece of jigsaw puzzles but I am stumped at the 3D crystal puzzle I received from Chicken during Christmas 2014. 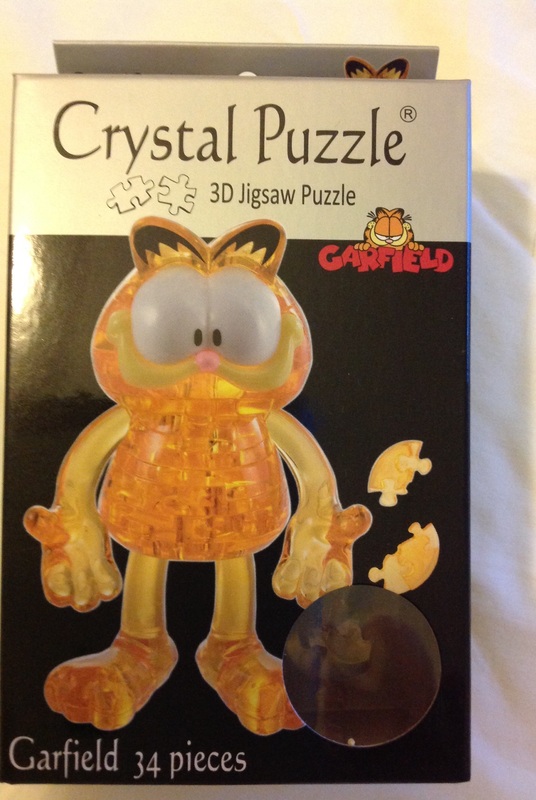 3D Crystal Puzzle Of Garfield – A Rarity Indeed! This puzzle is tough and it is not simply getting the pieces to interlock by visually seeing it as I will need to figure it out in a “3D” manner. I read somewhere that really, we do not see things in 3D but 2D…. I am not one to be baffled easily and so, as I sat and spent time looking at the pieces, I admit, I am literally stumped. I have got Garfield’s ears done. His tail is in place and his arms are locked into a piece but it is his torso that is tough as it has to be “tiled” in such a way that the full figure is made up. Only then, can the head, arms and limbs be created. I went to bed last evening in a lot of pain. My spine was acting up and I could feel the swelling on my spine where implants were. This affected my legs and I felt poorly with a congested chest. I must have caught a bug again and I quickly popped Vitamin C & E.
I hope I overcome this bug as my last bout with the dreaded flu set me back 2 to 3 months to heal. As I swathed self with Bengay and popped an anti inflammatory pill with Paracetamol in case fever spikes. On days like this, I wish I could sit in a tub of bengay to bring the pain down. LOL! I am tired. I text my dad to let him know I felt ill. His reply was, ” you must have overstrained yourself” and I believe him as I do push self beyond limits as I refuse to accept my own frailities. The King of Bhutan once had an audience with Mr Lee Kuan Yew and asked my founding father, Mr Lee Kuan Yew, for blessings. The King of Bhutan further shared that he kept this voice of Mr Lee in his mind everyday as he does his duties. I spent some time this weekend trying to put together a 3D puzzle of Garfield without much success. It is truly tough! 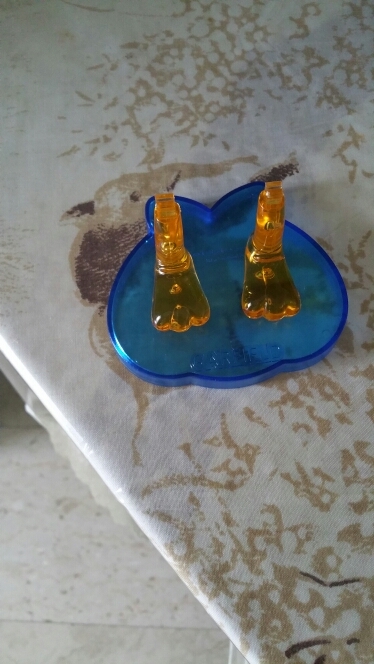 All I could manage was Garfield’s feet! I am not expecting a fun Monday as there will be unkind remarks from my head honcho for no rhyme or reason. He delivers unkindness ad naseaum! I truly find it hard to be under the thumbs of a supervisor who slanders just about anything and everyone. Like a disease he reeks….if only he will genuflect and be nicer professionally. This is all I seek and ask. Ms Sour Plum has done some serious anti establishment errors and I am seriously considering disciplinary actions against her. Thus far she has sailed through without major management issues but on Friday evening, she withheld pertinent information for management, which proved her destructive character. This was to me dangerous as she showed me the mind of someone capable of doing things against the grain of ethics and integrity. To ensure that it was not my anger talking, I told her that my decision will be made on Monday as to if she will be issued with disciplinary measures. My head honcho has to take ownership of her character development. 6 months he arrived before me but he had no sense of management to groom or develop Ms Sour Plum to be an upright and motivated employee. Today was the culmination of a week of national mourning. The late Mr Lee Kuan Yew’s cortege has left University Cultural Center for a private family funeral, followed by cremation at Mandai Crematorium. My warmest thanks to all my kind readers for joining me this week in my personal tribute to Little Red Dot’s Founding Father, the late Mr Lee Kuan Yew. I hope I did not burden you with the same topic for much of this week as our nation mourned. Admittedly, it was hard on me, like it was for all Singaporeans and worldwide. We were honored to have ASEAN and ASIAN leaders; Australia amongst others. It was particularly hard for me as I have met and interacted with this great man. And it is not an easily forgotten memory….this is so typical of any who has met this great statesman. The funeral eulogy was delivered by 10 members with the first led by the son and Prime Minister of Singapore, Mr Lee Hsien Loong, followed the President of Singapore, Mr Tony Tan and with the last delivered by Mr Lee Hsien Yang, youngest son of the late Mr Lee Kuan Yew. My thoughts and heart goes out to the family who are bereft. No one can forget this great statesman! Sunday….this is the day of the sabbath as Christians call it. The day of rest after God created the Earth. I still believe in Big Bang Theory, with due respect to a “special or supreme force” that “made” earth. Sunday to me is part of Saturday that forms my weekend to do chores as I rest from a financial paying job. My part time help is here and as I hear the whirring of the vaccum cleaner, I reminded this person to save his monies carefully. Frugality was key since this person hailed from a less developed country. When the vaccum was turned off, I heard the stillness of Sunday morn. Odd!! Not a bird chirped in the skies nor in the trees surrounding my estate. Unusual as the mynahs or sparrows would be exchanging twitter and I do not mean social media’s twitter LOL! The silence is unnerving as if the birds know that today’s solemn occasion starting at noon was not one to be trifled with. As I read the papers, quick math again as I saw the stats of visitors. Some 450,000 queued to file past late Mr Lee Kuan Yew at Parliament House whilst another 1,000,000 people queued to pay respects at 18 different community areas…24 hours, over last 4 days. Queues lasted on average 10 hours at Parliament House. Today is going to be another outpouring of grief as I expect thousands to throng the streets dotting the funeral procession all 15.4 km of it. Black Knights our aerial jet fighter pilots will fly a missing man formation. Naval ships will sail past Marina Barrage with black flags bearing letters L, K & Y. A 21 gun salute from powder guns will be fired at the Padang. A lone bugle will sound and before it nears the minute of silence to observe, trains will pull to a halt at nearest station, open its doors as we recite our national pledge after the national anthem. As the funeral procession goes past the late Mr Lee Kuan Yew’s ward, Tanjong Pagar and Cantonment Police Station, Police Bagpipers will play Auld Lang Syne. Meanwhile India has declared a day of national mourning today in India and New Zealand will fly its flag at half mast. Kings of Malaysia and Bhutan are here. Emir of Emirates, world leaders include former Bill Clinton, Dr Henry Kissinger and many many others are in our little red dot paying respects to this great man we call Lee Kuan Yew. For many who have nothing good to say, I wonder why when the world seems to do so. Big wigs titans such as Mr Li Ka Shing and his son were amongst first to arrive. Last evening, Mr Jack Ma of Alibaba arrived. Many are wondering if Mr Thaksin will also pay his respects. Today is a solemn day as we bid our final farewell to Mr Lee Kuan Yew on his final journey. This week has been hard on our PM Lee Hsien Loong and his family as he is sharing his late father with us. As a son of Mr Lee Kuan Yew, he must have known the sacrifices his father made for us and he had to share his father with us. I feel his pain. Not everyone can be so selfless as Mr Lee Kuan Yew, putting country first always. Today’s statistics in the papers floored me as I saw the staggering numbers in wealth, teacher to student ratios, patient to doctor ratios, nurses to patients ratios etc. As a fellow Singaporean, I owe much of what I have today to Mr Lee Kuan Yew. Undeniably…..maybe that is why the birds are silent too. I await to hear 10 eulogies to be delivered today…..it is a sad day for me and Singaporeans.